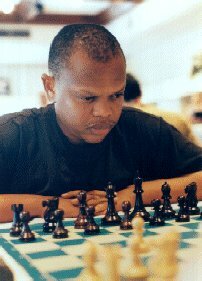 South Africa's Kobese treks to India for World Chess Cup! South Africa's IM Watu Kobese is now in at Ramoji Film City, Hyderabad, India to take part in the World Chess Cup 2oo2 which starts October 9th. Kobese stands at the bottom of a field which includes GMs Viswanathan Anand (India), Alexander Morozevich (Russia), Vassily Ivanchuk (Ukraine), Alexey Dreev (Russia), Ye Jiangchuan (China), Nigel Short (England), Teimour Radjabov (Azerbaijan), and Hichem Hamdouchi (Morocco) among others. However, he has long promised some surprises for his unsuspecting opponents. Reports indicate that the opening ceremony ended with a bang… literally. A dazzling fireworks show was said to enthrall the attendees and one can be certain (with the listed field) that fireworks will be seen on the chess board. South Africa's Jackie Ngubeni is also in India and will serve as correspondent for The Chess Drum's coverage. The views and opinions expressed in the World Cup tournament reports are not necessarily those held by The Chess Drum. IM Kobese crushes GM Yermolinsky! Russian Bear beats African Lion in fierce fight! Kobese ends World Cup on high note!